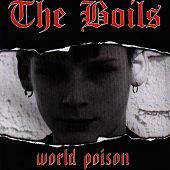 Philadelphia's The Boils are an aggressive street punk trio who take their political views and put raw, often melodic, doses of fast-paced guitar, hammering drums, and slippery bass lines behind them so you can not only understand what they're all about, but move along to their views as well. On their debut full-length, they prove they're a street punk band to reckon with. Opening with "Assassin," the band quickly sets the tone for the entire album: action-packed, juicy, powerful, and about as raw and pure as they come, they don't beat around the bush. "Police Me" keeps the good times rolling with another raw street punk number; this time around though they make sure its slightly bouncy and has a melodic edge to it so you can hook onto it, sing along, and really get into it. As the album progresses, so does the emotional level of the lyrics and music. "The Pride," "Moral Crusaders," "Secret War," "Kids With A Vision," and "Sweatshop" all paint a vivid scenery of what the band is trying to get across to the listener. The lyrics are political and harsh, and the music is the exact same way. From the album opener of "Assassin" to the final beats of "Wake Me When It's Done," the band keeps you intensely listening and thinking throughout. I'll give it a B.